注意 FTPS 與 SFTP 不同喔!! 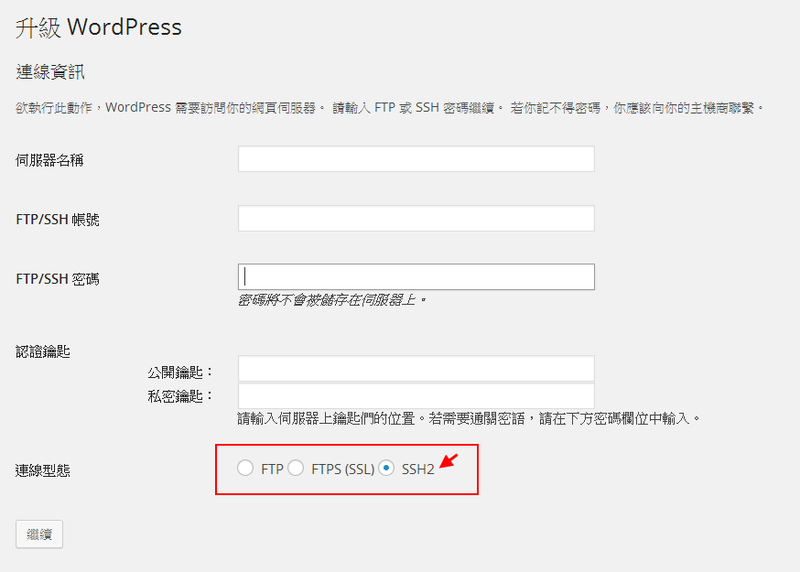 FTPS 是 FTP (Port 21)使用 SSL 的連線方式,但 SFTP (Port 22)是以 SSH 的方式做連接. 那要怎麼讓 WordPress 的連線型態支援 SSH2 呢! !其實很簡單只要讓你的 Apache 支援 SSH2 即可以使用. CentOS 6.7 要安裝的是 epel-release-6-7.noarch.rpm 請依據實際環境安裝 EPEL 版本. 主要就是安裝 php-pecl-ssh2 (PHP SSH module) 這個套件. 重新載入 Apache 即可,我們可以透過 php 指令來查詢. 用了 SSH 可以順便設定金鑰,就不需要再輸入帳號(使用者 ben 為範例)密碼了. SSH2 採用 RSA Asymmetric Encryption (非對稱式加密) 來做身份確認,主要透過 傳送端 產生兩把鑰匙 (公與私 Public / Private Key) 來確認身份,方法如下. SSH Server (Ubuntu) 會把他的公開金鑰提供給 SSH Client 來作加密使用. SSH 伺服器會檢查 SSH Client 指定的使用者是否有儲存公開金鑰在 $HOME/.ssh/authorized_key 檔案中. 沒有 – 基於密碼的安全驗證,SSH Server 會提示使用者輸入使用者密碼(前面的方式). 如果私鑰存在,SSH 會提示你輸入此私鑰的通行證 passphrase ,接下來會使用這私鑰來建立簽章並傳給 SSH Server. Your identification has been saved in /home/ben/.ssh/id_rsa. Your public key has been saved in /home/ben/.ssh/id_rsa.pub.